What is fall without a little faux fur anyways? If you're spending a long weekend up north, this is the perfect outfit to pack. Once again, I've added a scarf (faux fur edition this time) that can easily be removed if the temperatures spike. 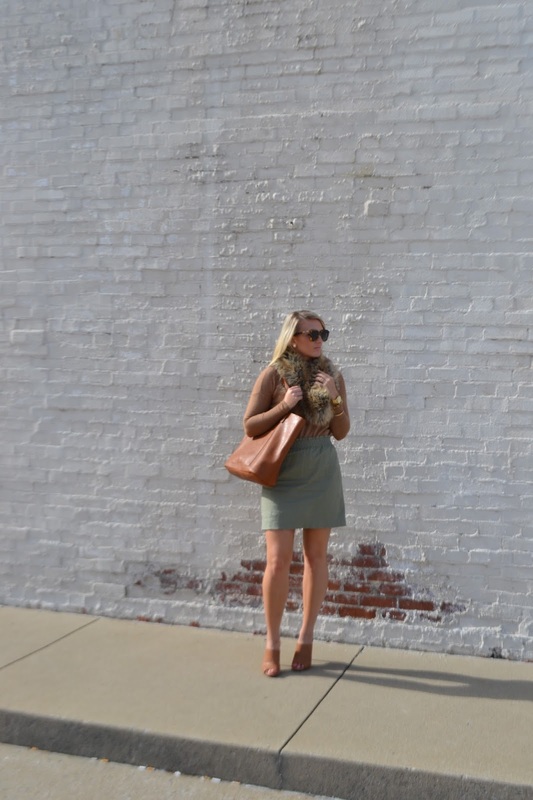 The whole outfit sticks to Earth tones which is seen all throughout the fall season. I've added in my classic gold jewelry to give the outfit a little pop of sparkle. This weekend you can find me downtown celebrating the annual BBQ on the River festival here in Paducah. Make sure to follow along via snapchat (@kitty_621) and Instagram (@kathrynbyers). For those of you who don't know me personally, I work for Paducah Life Magazine here in Paducah. I put together a fashion column for the magazine as well as styling here and there for other articles. This is just a little preview of the work I did (with the help of my gorgeous friend Carson pictured below) for the fall edition! Although this trend might look hard to tame, it's actually the most effortless way to add luxe and style to your fall wardrobe. Faux is the way to go -- we want to have fun with our little furry friends NOT wear them! Kathryn's fashion brief: Fur is not the time to layer. Limit one piece per outfit, ladies! Subscribe to Paducah Life here! Loving this look, Kathryn! The jacket is so chic and perfect for fall. I love how you paired it with a military green skirt, perfection! Love those sunnies and skirt! Such a great fall outfit! Thanks, Brooke! These sunnies are my favorite.